When luxury of golfing and monumental heritage meet, one of the rare experiences in India i.e. Delhi Agra Golf Tour comes into realization. Golfers get to cherish the golfing on the oldest Asian greens in luxury enhanced with a tour to the renowned world heritage of Taj Mahal during Delhi-Agra Golf Tour. The golfing lawns to be conquered in this exciting tour include Golden Greens Golf Club, Delhi Golf Club, Jaypee Greens Golf Resort and Qutab Golf Course. Upon arrival in Delhi, meet Incredible India Tour Representative for assisted transfers to the hotel. Day is at leisure in the capital of India, Delhi. Enjoy the breakfast at the hotel. Around 09:30 am, meet the tour guide, prior to the beginning of Delhi’s sightseeing. Delhi encourages tourists to discover the different facets of this destination. An inviting blend of old and new, the city offers unique experiences to its prized visitor in the most desirable way. 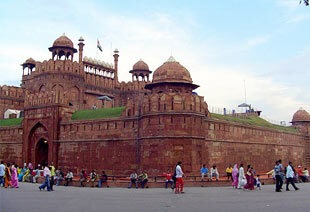 Begin the delightful sightseeing of Delhi with a visit to the Red Fort, the epitome of Mughal splendor. (Red Fort remains closed on every Monday.) It is addressed as ‘Red fort’ for the extensive use of red sandstone in its construction. A UNESCO World Heritage Site, this massive fort was constructed by Mughal Emperor Shah Jehan as a place of his residence in Delhi. The fort also overlooks the imperial marketplace of its times, famous as Chandni Chowk. A small walking tour through the narrow lanes of Chandni Chowk will lead you to the Jama Masjid. This is the largest Muslim mosque in India. Next in the schedule is the visit to the Qutab Minar and Humayun Tomb, another UNESCO world heritage sites in the city. Followed by this, a drive through the Lutyens Delhi is scheduled wherein you will witness the splendour of India Gate, a 42 meters archway built as a memorial of Indian soldiers. Also, here you will enjoy the ecstatic privilege of driving past the Rashtrapati Bhawan / President’s House of India. In evening, visit Connaught Place, the bustling core of the city famous for its shopping arcade. Return to the hotel for overnight stay. Next in the Delhi-Agra Golf tour is a visit to one of the oldest Asian golfing club, Delhi Golf Club. 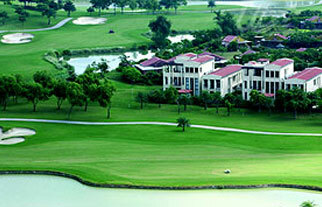 Established in 1911, the golfing green is located in the posh locales of 15th century estate of Lodi Dynasty. Spread over 220 acres, this 18 hole golf course is renowned for its widespread green cover. The golfing laws have more than two hundred varieties of trees and acts as a bird sanctuary as well. In fact, there is a special 9-hole peacock golf course for kids and elders. After spending the day in golfing, return to the hotel for dinner and overnight stay in Delhi. Further on fourth day, avid golfers get to tee around one of the finest golf courses in the country, Jaypee Greens Golf Resort. This 18 hole golf course is the only one to be designed by ace golf club designer Graham Cooke & Associates. Spread over 54.63 Hectare (ha) of lush area, Jaypee Greens Noida offers one of the finest golfing experiences in the country. Numerous lakes dot the grounds and offer plush, serene and refreshing views of nature’s best kept beauty. Amateur as well as seasoned golfers are welcome here to play the game in an exciting setting. 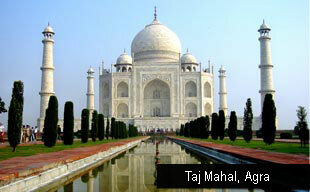 Afternoon, continue a drive towards Agra and upon arrival, check in the hotel for overnight stay. Early morning visit to Taj Mahal in Agra. This world heritage site has captivated both young and old, for its intriguing monumental structure of unparalleled beauty. Built by a mourning king as a tribute for his deceased wife, Taj Mahal is one of the brilliantly carved architectural specimens in the world. Also, the visit to this dream-like monument is one of a must visit heritage sites in India. This is the prominent reason why we have included this in our exclusive Delhi-Agra Golf Tour. Also visit Agra Fort, the majestic fort citadel established by Mughals in the medieval history. This is also a world heritage site in the city renowned for its elaborate history and complex architecture. After the sightseeing, spend the rest of the day in leisure. Overnight stay in Agra. After breakfast, check out Agra and move back to Delhi to board a flight back towards home country. In hours of leisure, you can also catch up with the last minute shopping session in Delhi’s emporiums. In time transfer to the international airport to board the flight as scheduled.